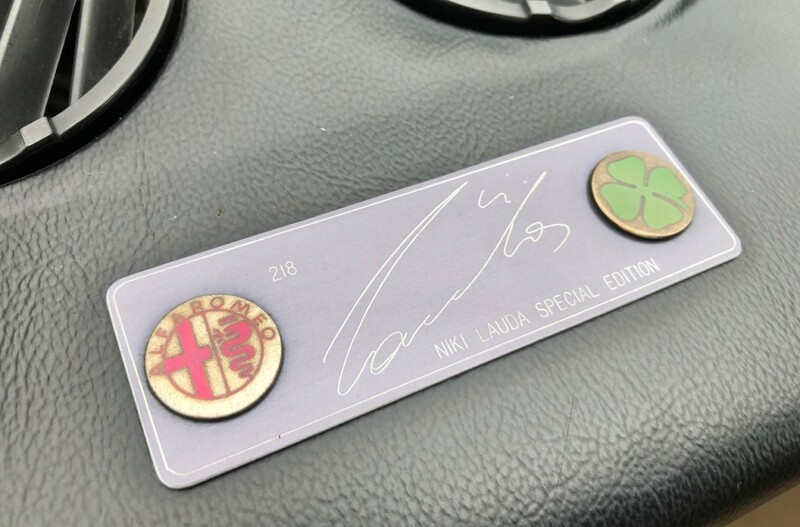 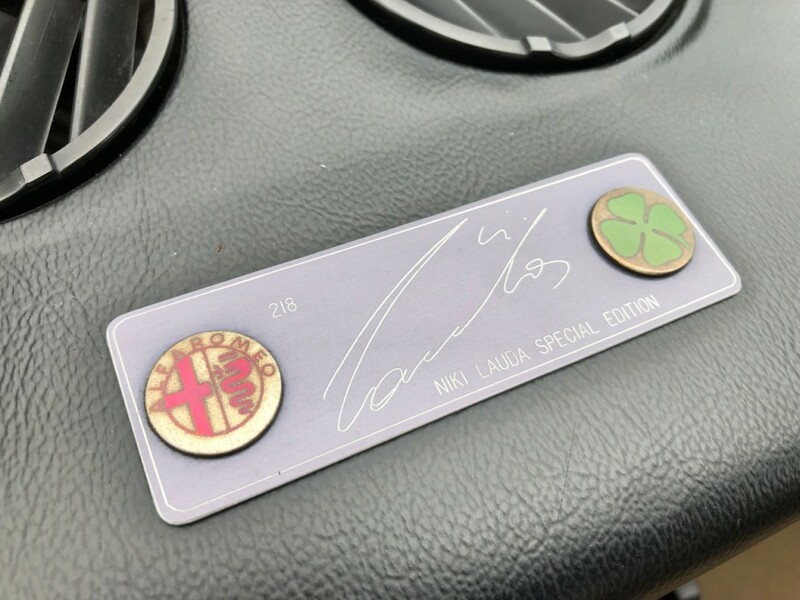 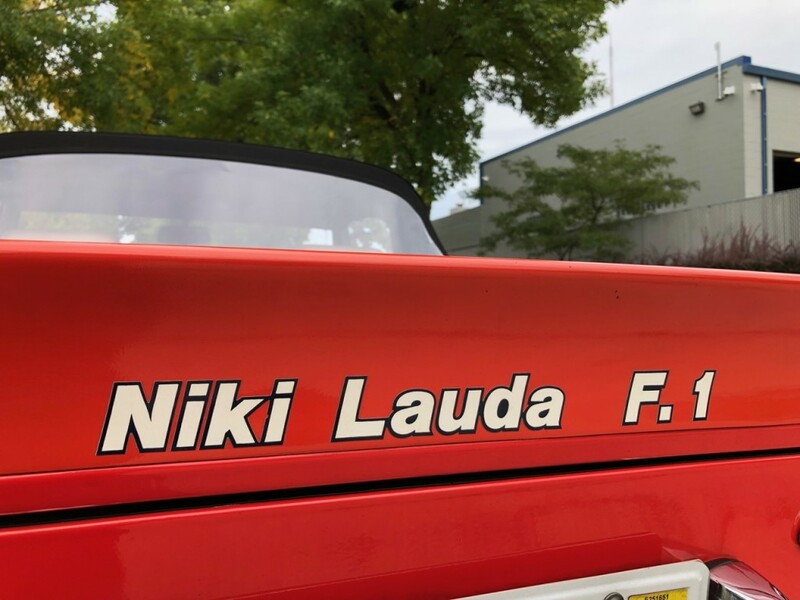 This incredible Niki Lauda Spider is #218 of just 350 produced and sold worldwide. 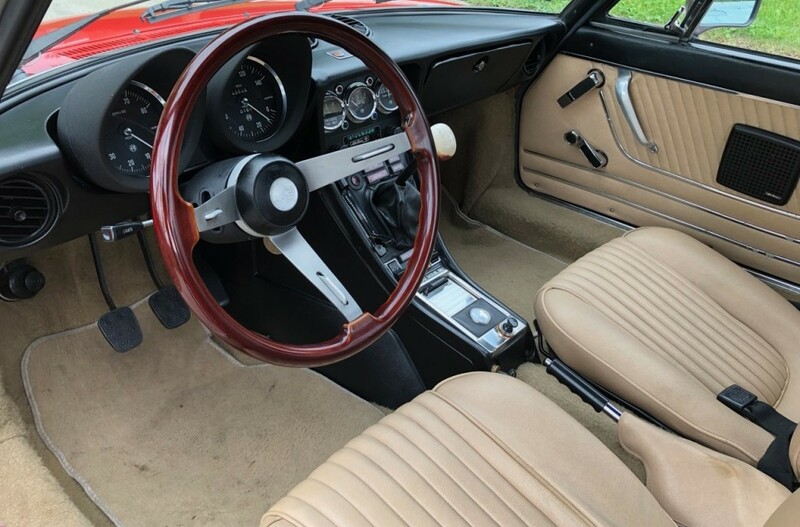 Better still it is a one owner car from new, has just 48,000 original miles, is completely original including its original factory Carman Red paint, amazing decals, and virtually as-new interior. 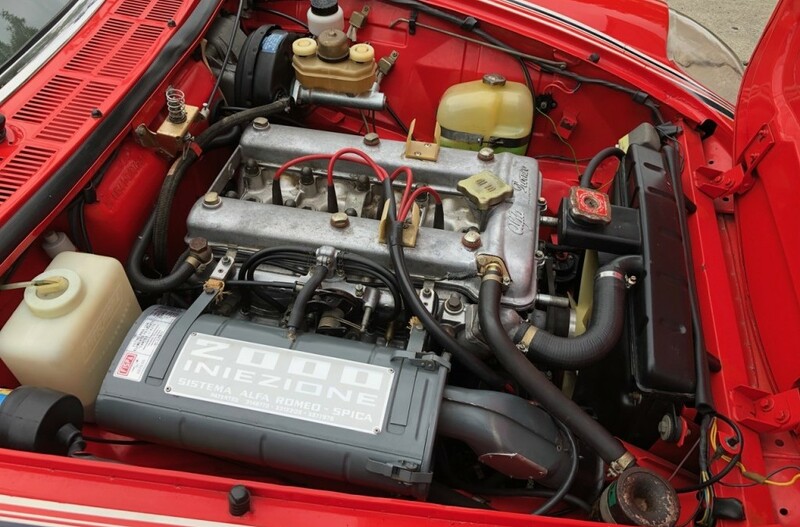 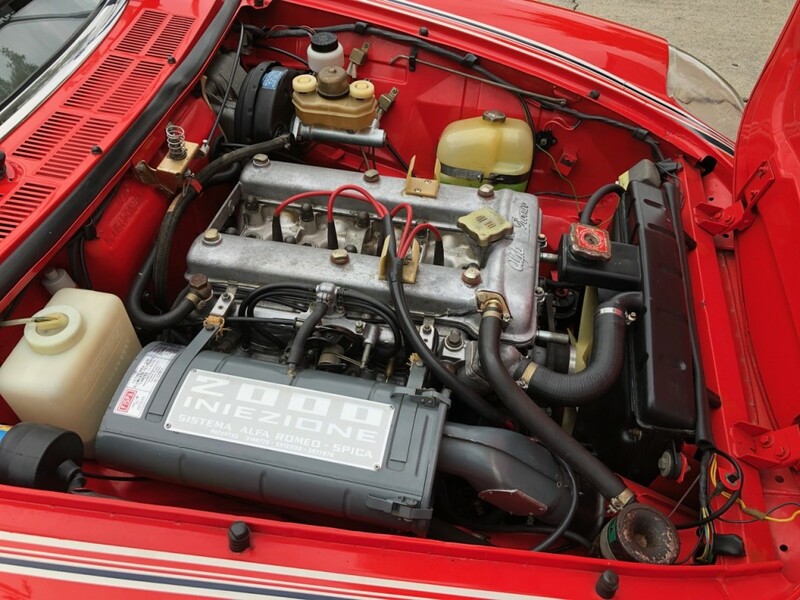 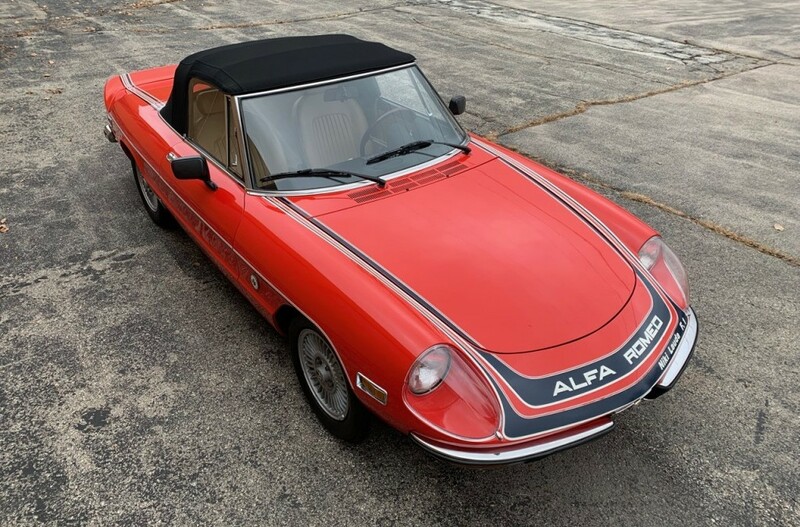 Simply put it is the kind of Alfa you just can’t find any more. 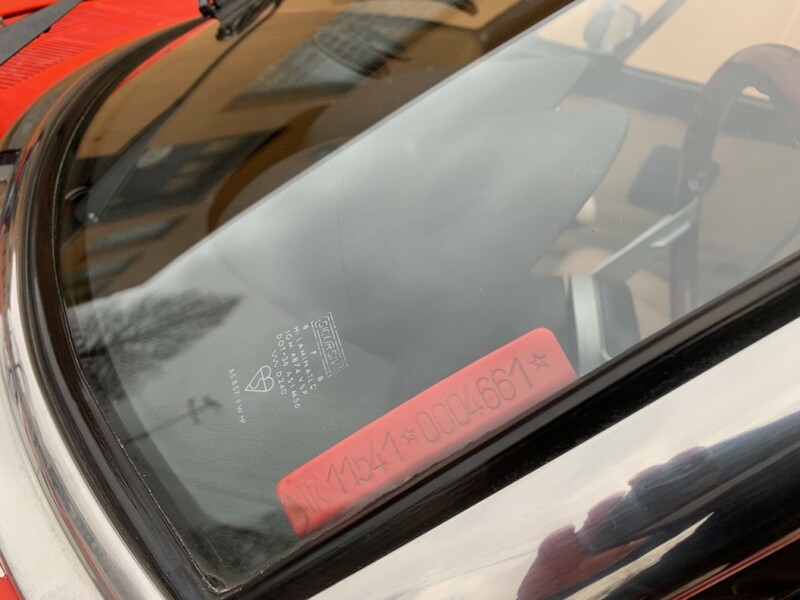 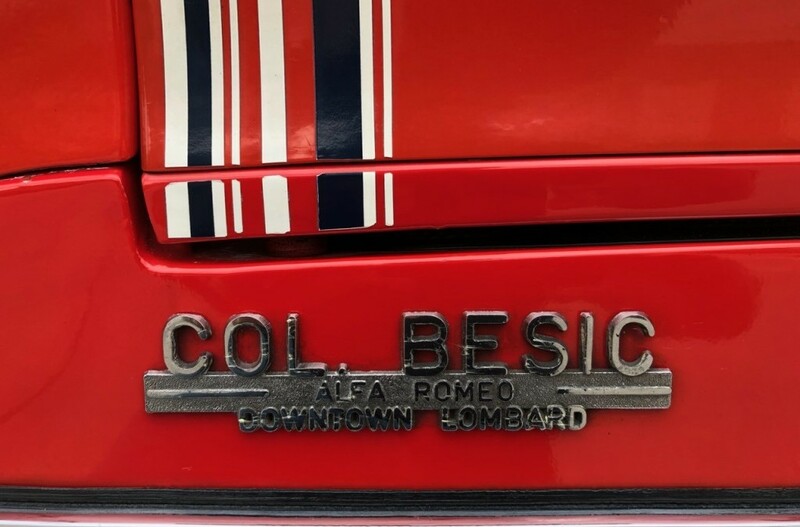 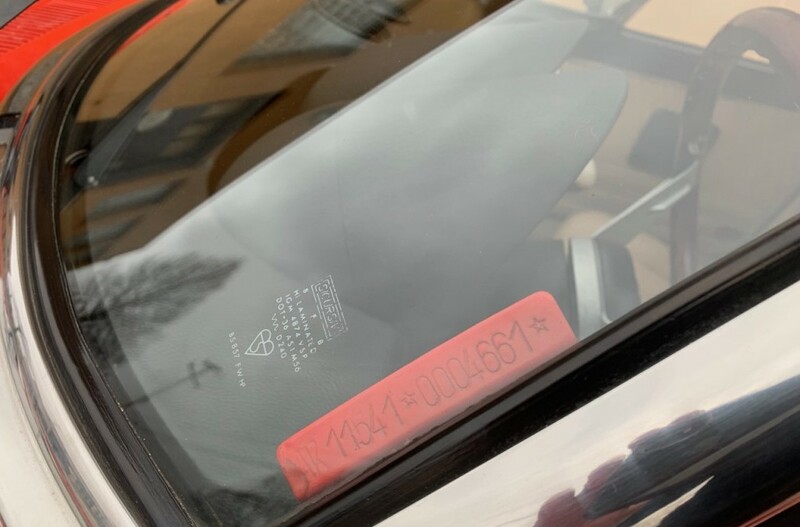 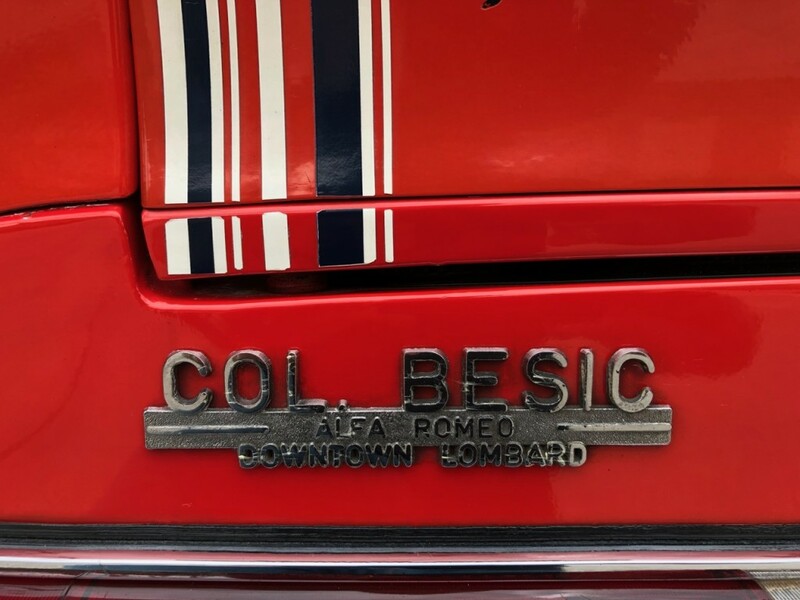 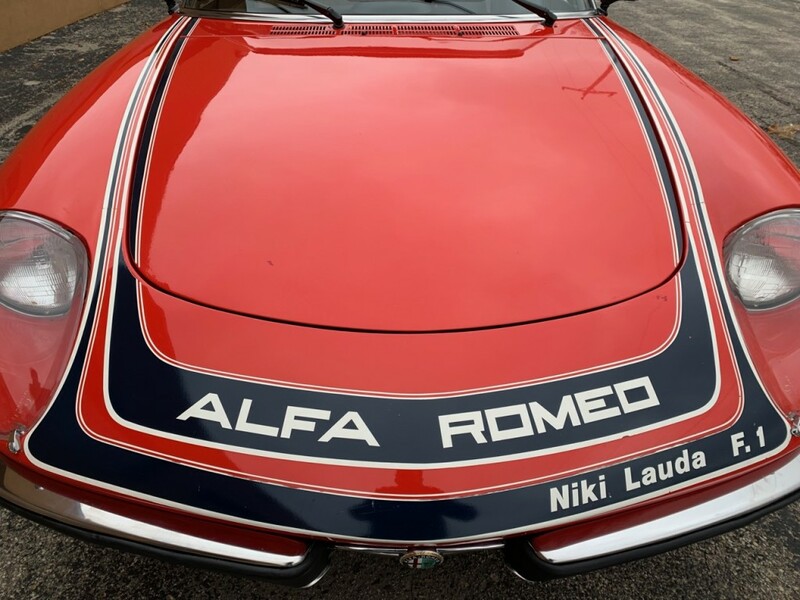 Factor in the Niki Lauda part and, well, I do not think there is a better example of this nearly extinct model in existence. 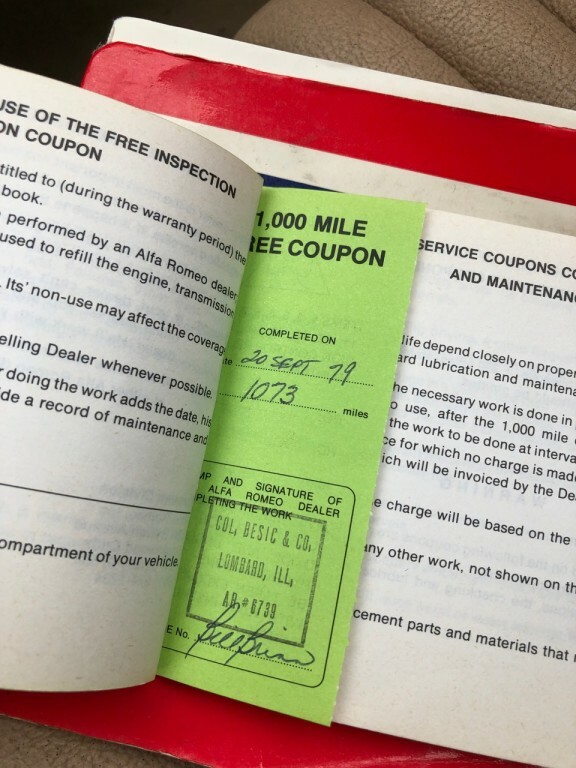 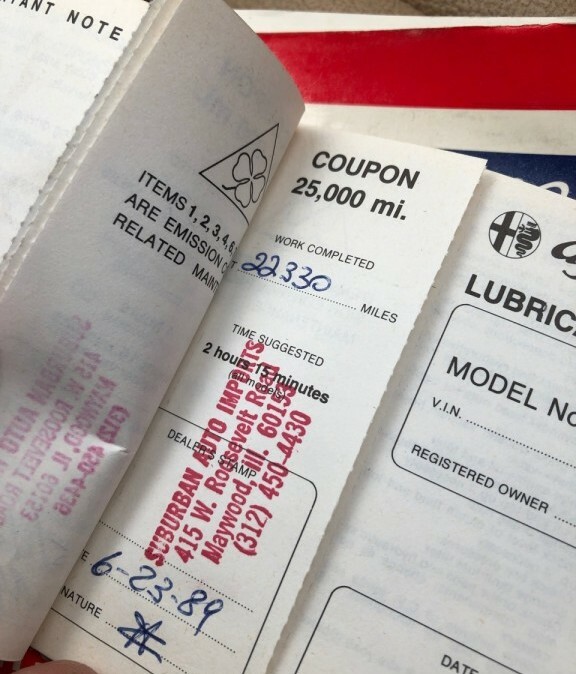 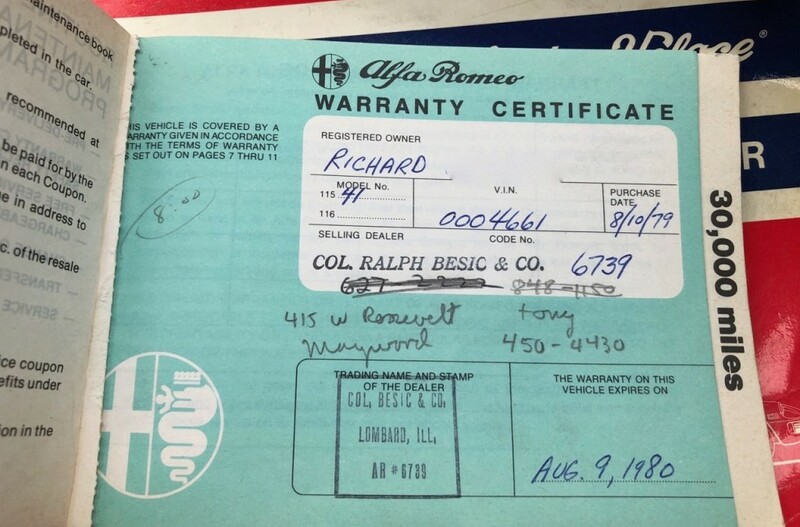 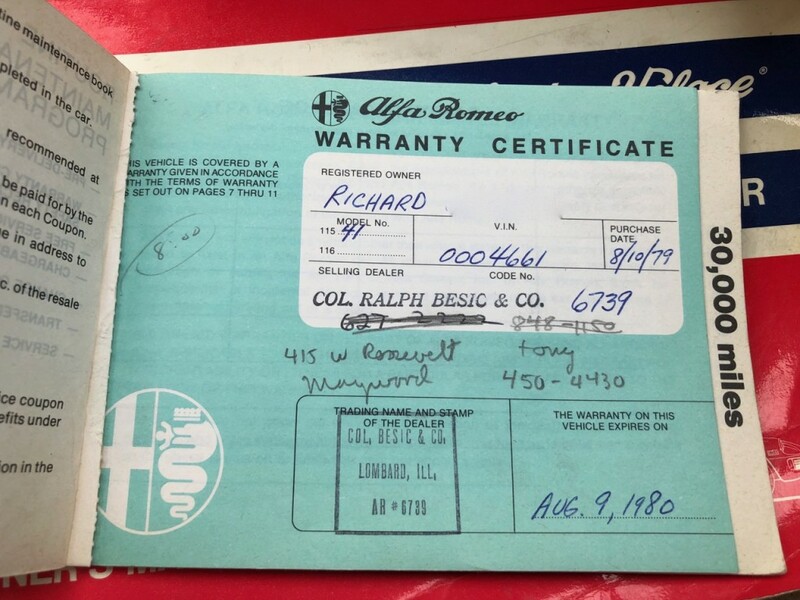 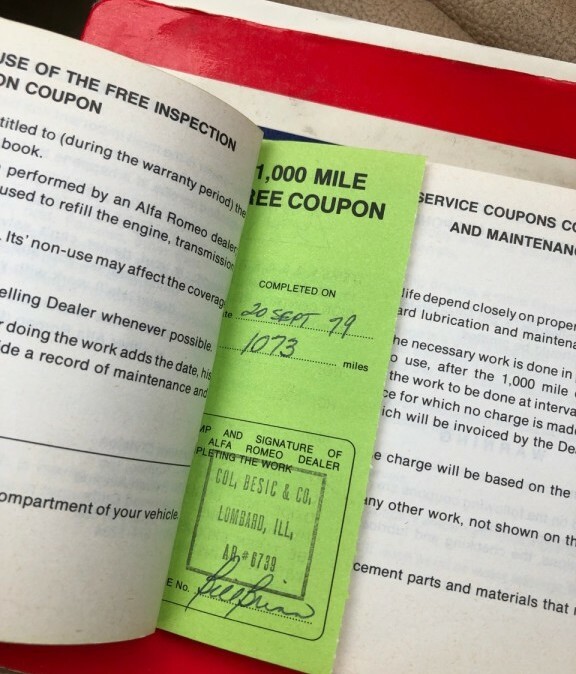 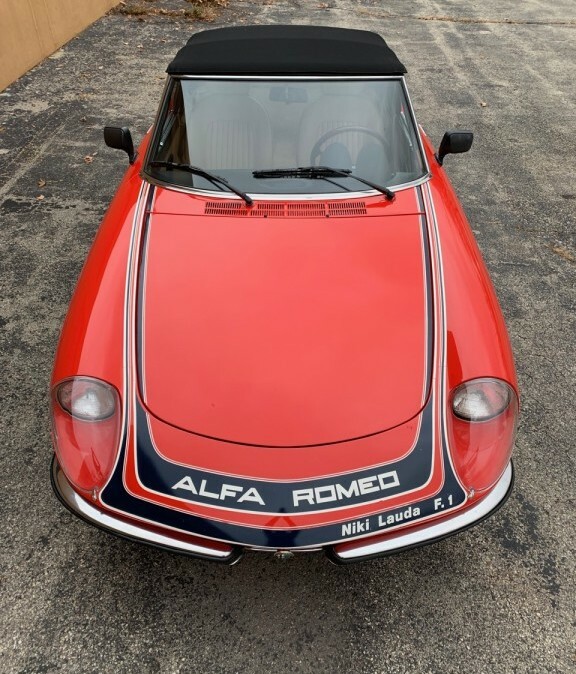 Sold new at Besic Alfa in Chicago, it also retains all of its original books, fully stamped maintenance book, and all delivery materials. 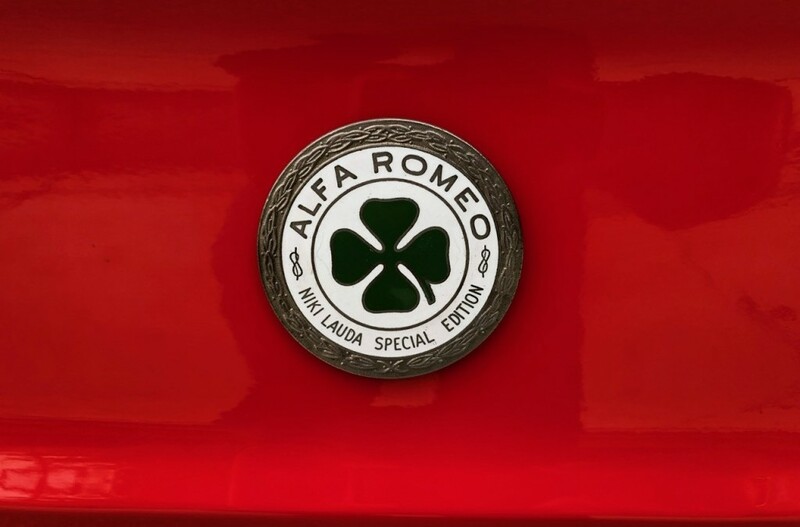 As a nearly life-long Alfisti (31 year AROC member this year, in fact!) 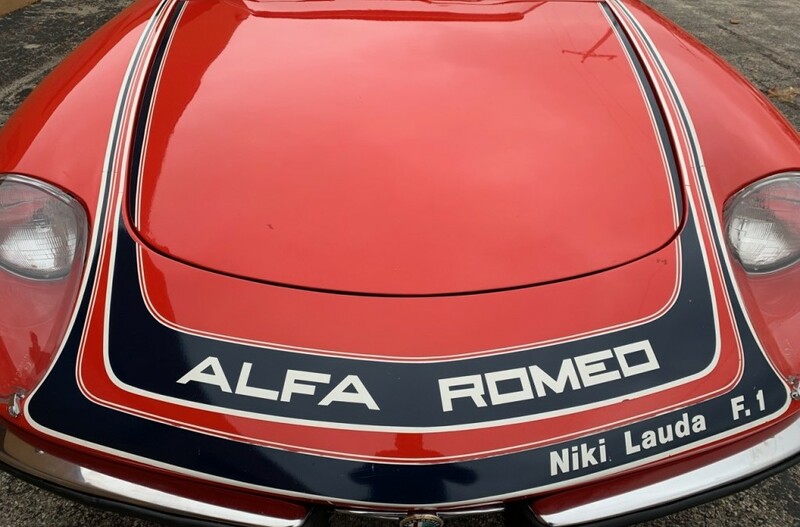 I’ve always loved these Niki Lauda cars and their unique, totally awesome 70’s stripe, spoiler, and headlight cover combination. 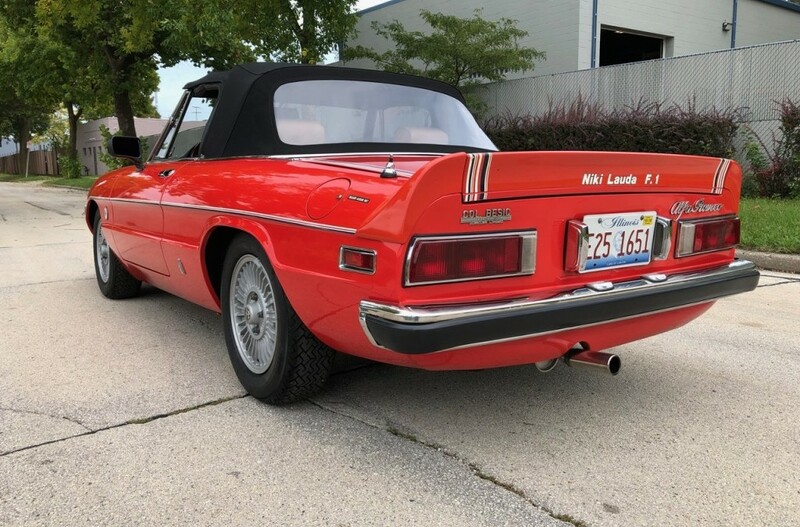 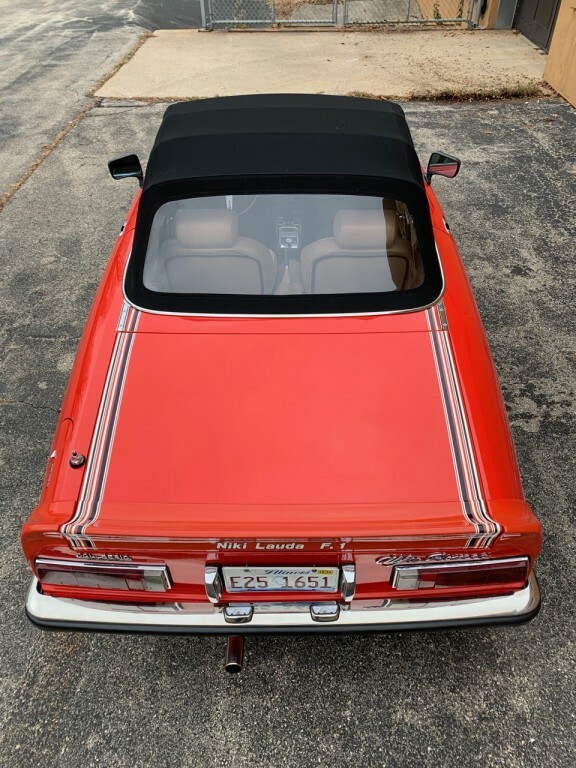 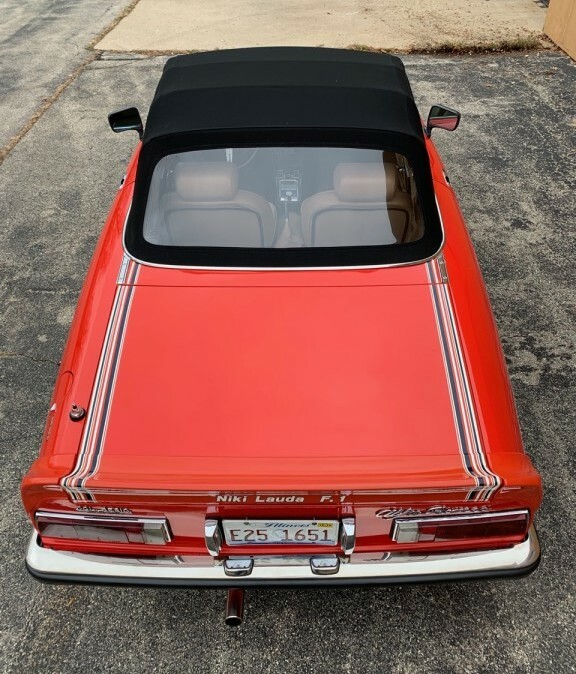 But I also have always disliked the US-spec ride height and ugly rubber baby buggy bumpers of the 1975-1982 Series 2 Spiders. 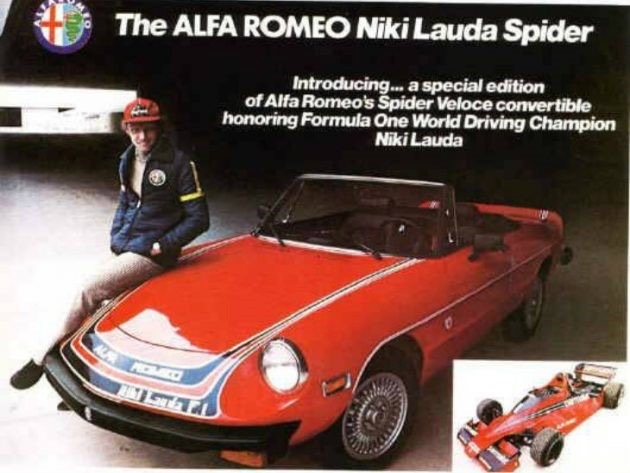 So when I acquired this killer Spider last year I knew I had to tweak it a bit to make it the ultimate Niki Lauda car. 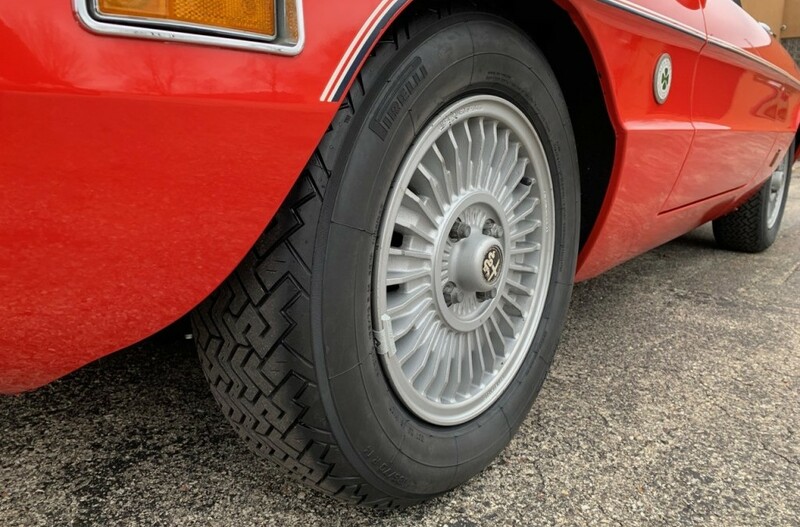 To do that I sourced a new set of Euro-spec stainless bumpers, a Euro grille, and a set of street performance springs and top-line performance shocks. 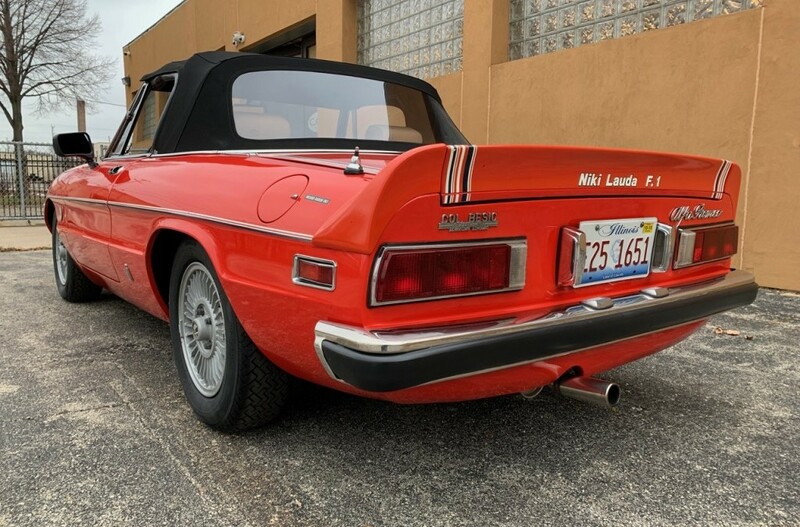 After that the car had the look, the stance, and the handling every Spider should! 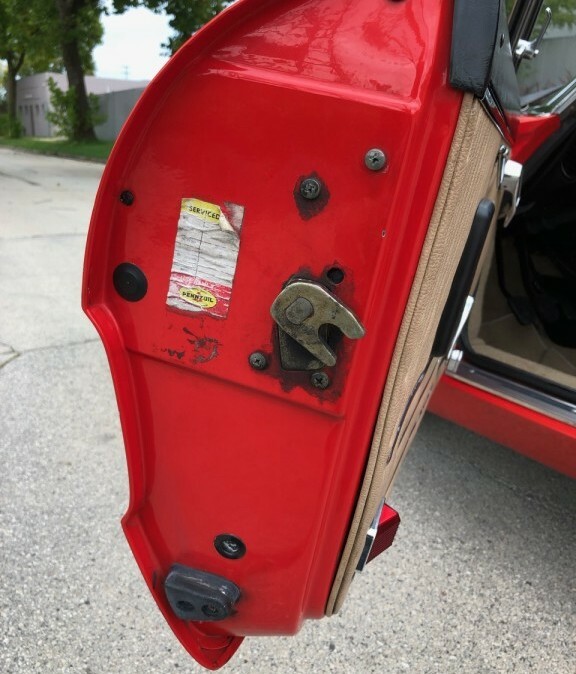 Plus it shed at least 75 pounds in the process…always a benefit on its own. 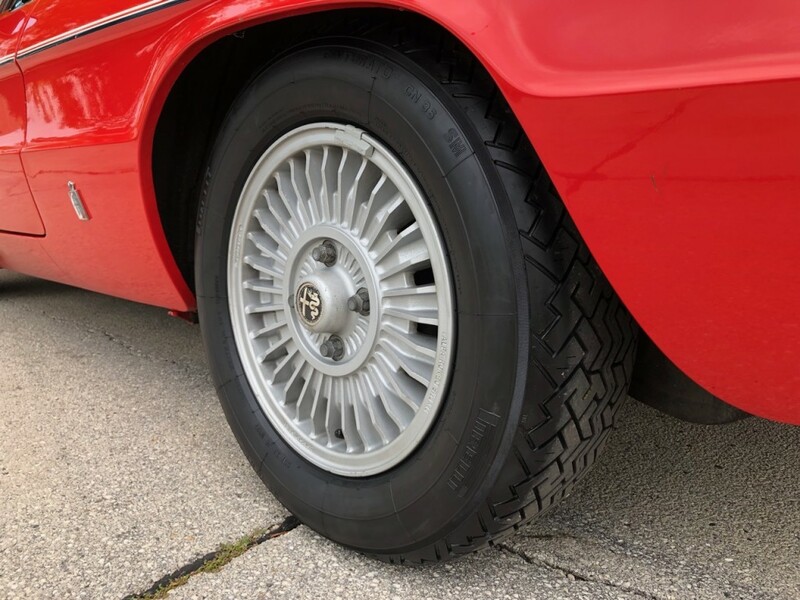 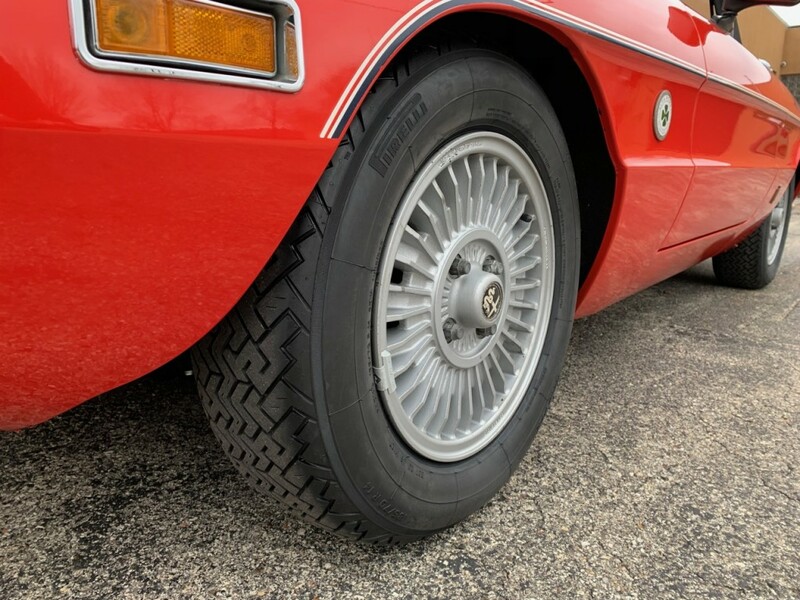 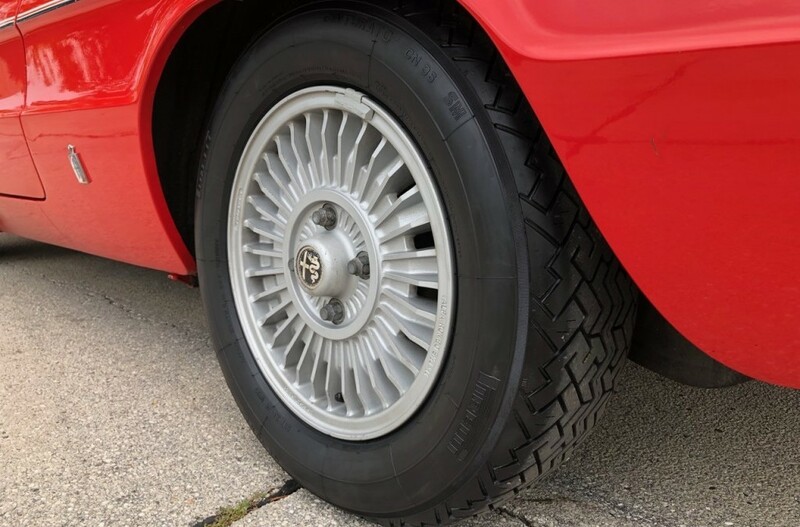 To top off this treatment I installed a new set of reproduction Pirelli CN36 tires to give it the grip and proper period look it also deserves. 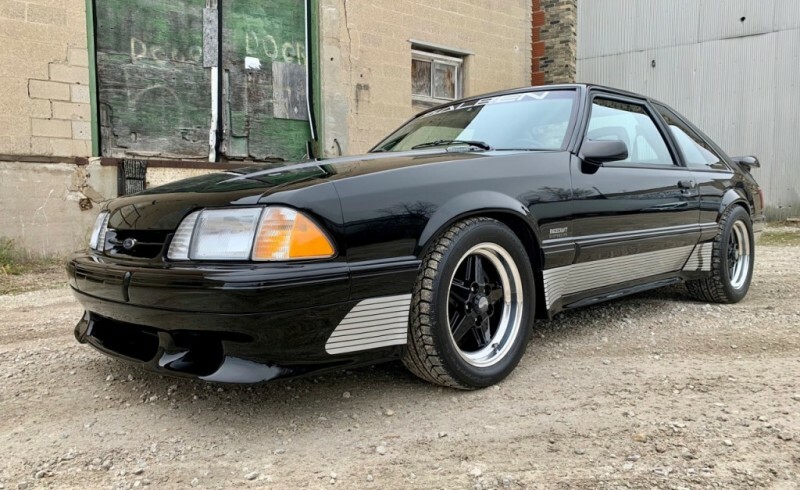 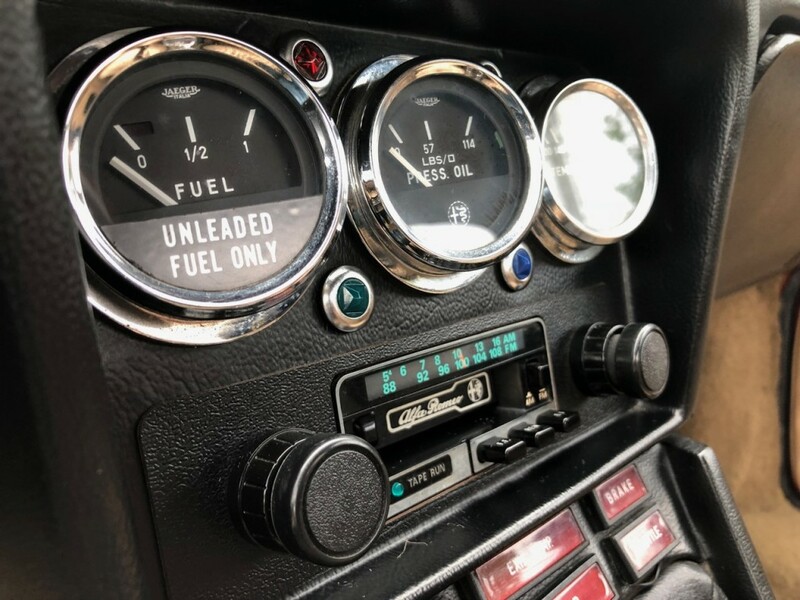 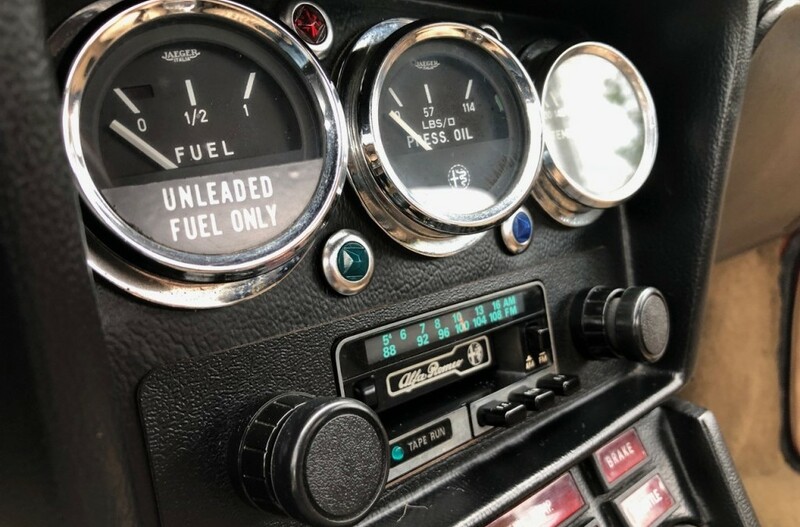 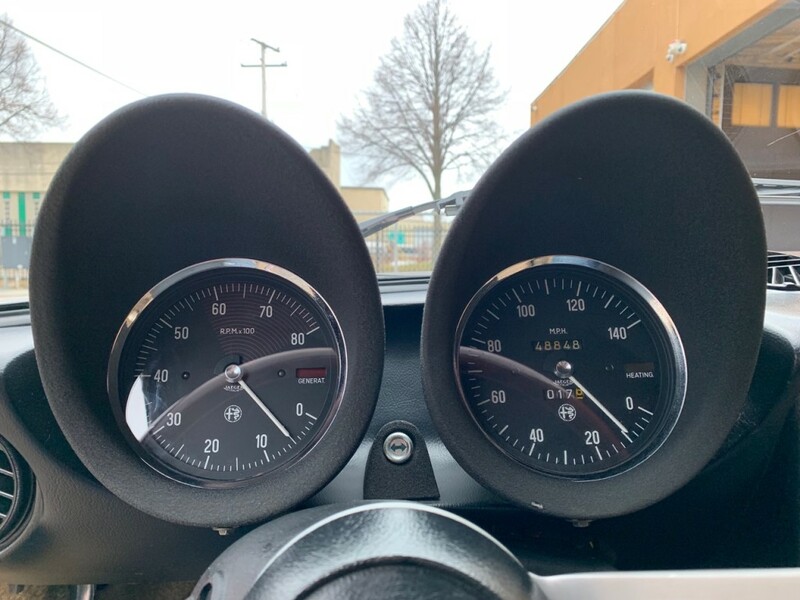 A full service followed, with fine tuning of the Spica fuel injection, an ignition tune-up, all fluids changed front to back and a good going over to make sure it has zero needs for its next caretaker. 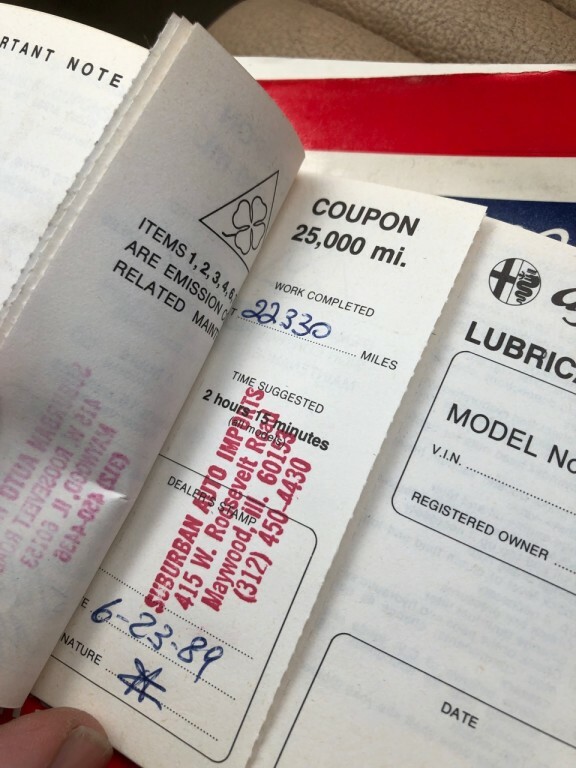 Of course the original bumpers, springs and shocks are also included. 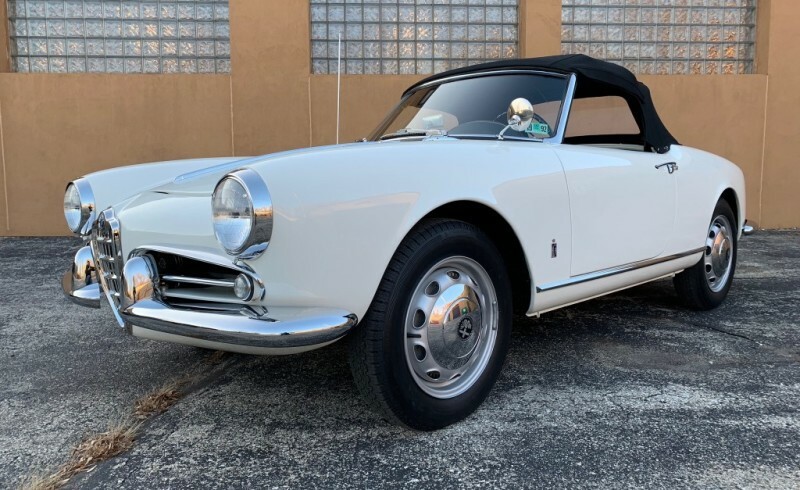 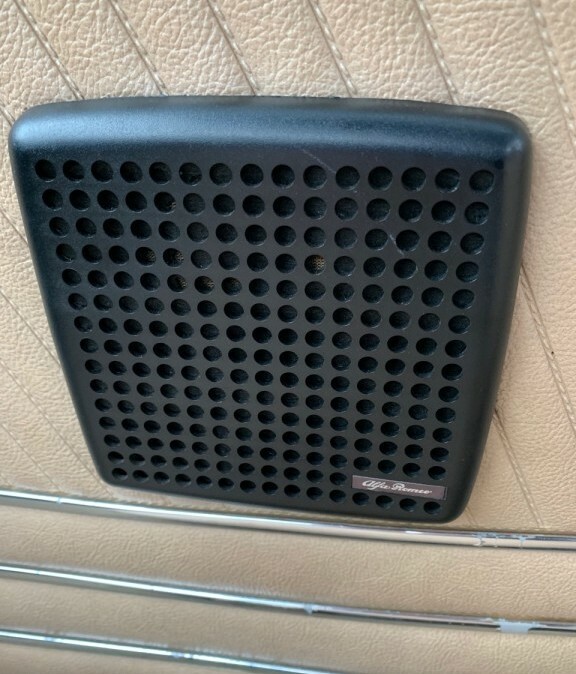 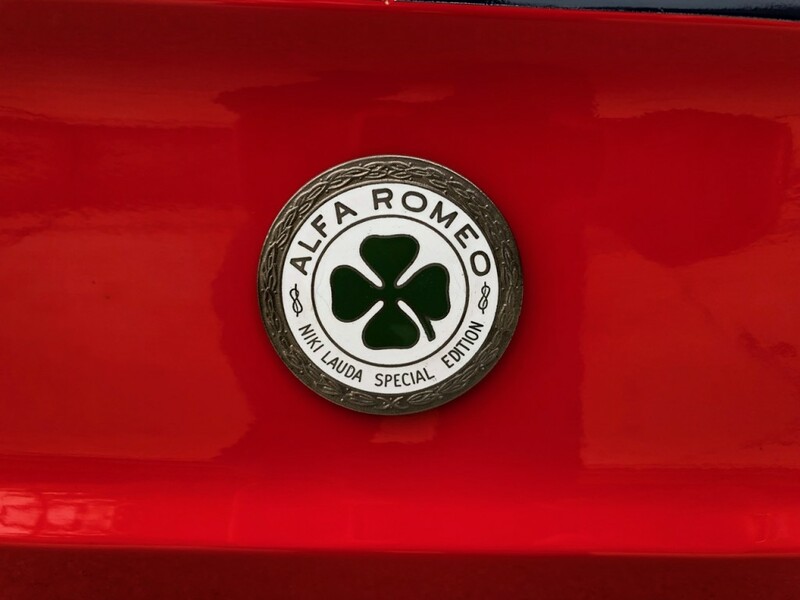 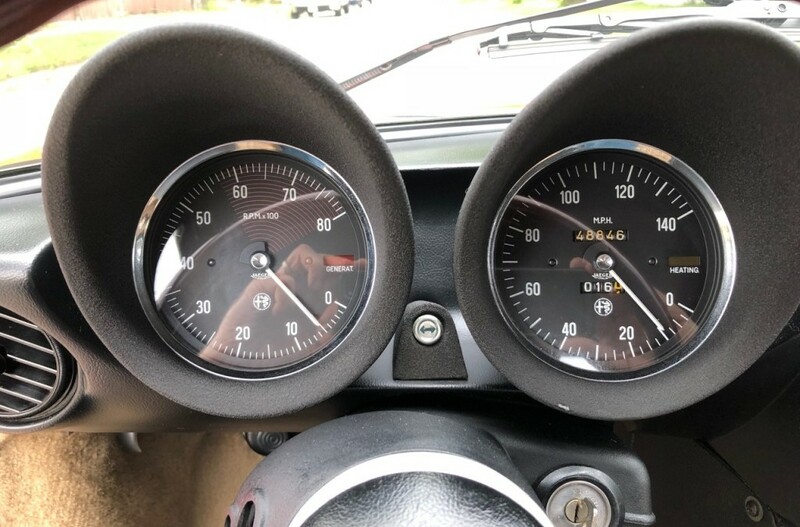 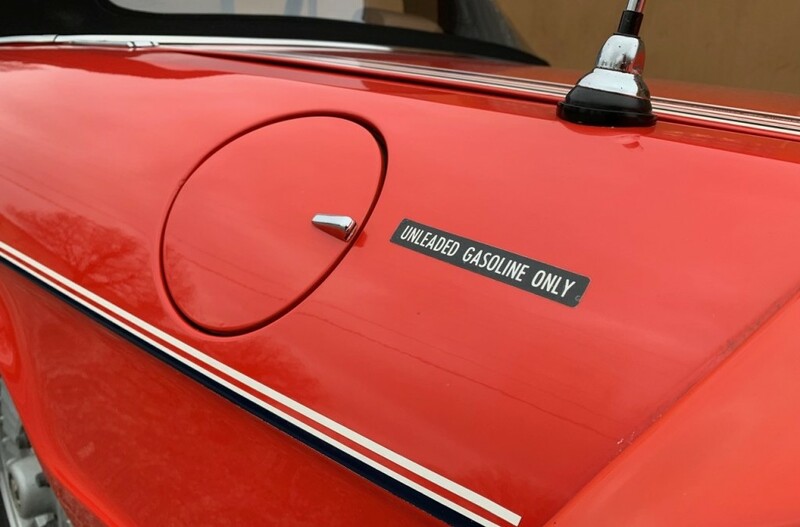 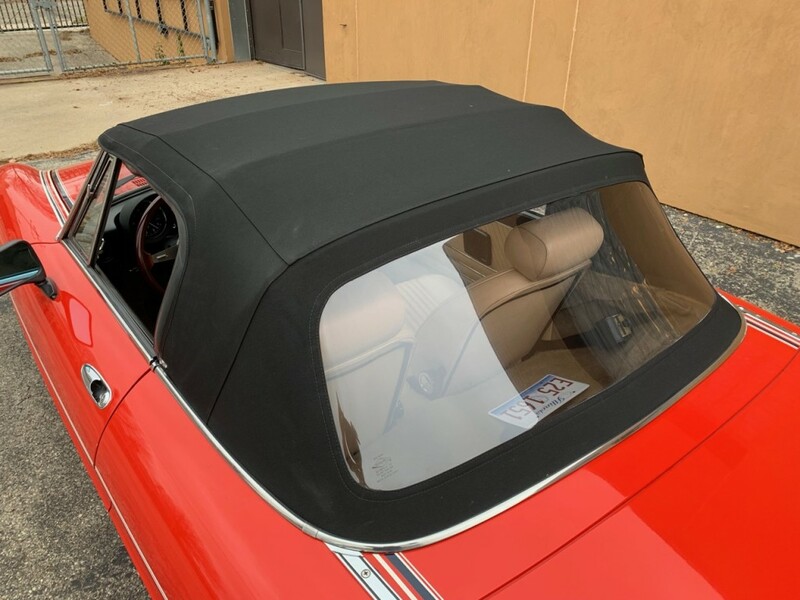 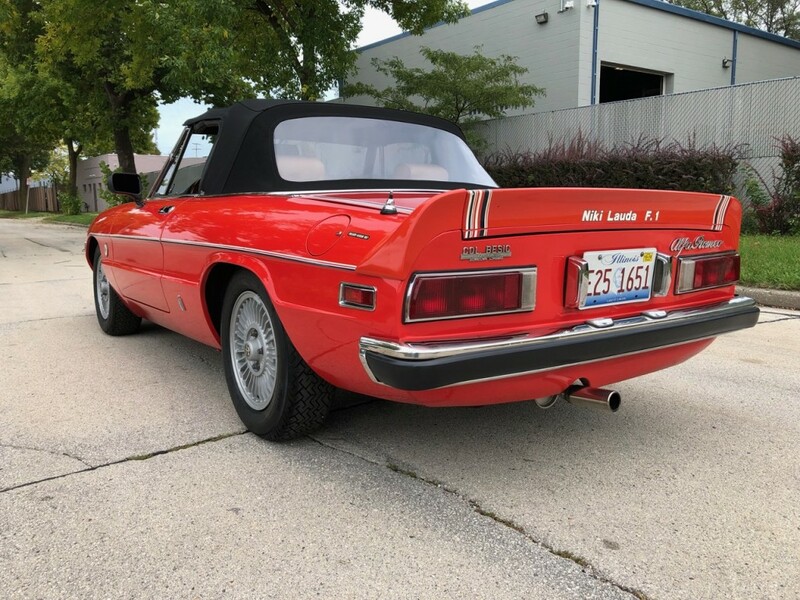 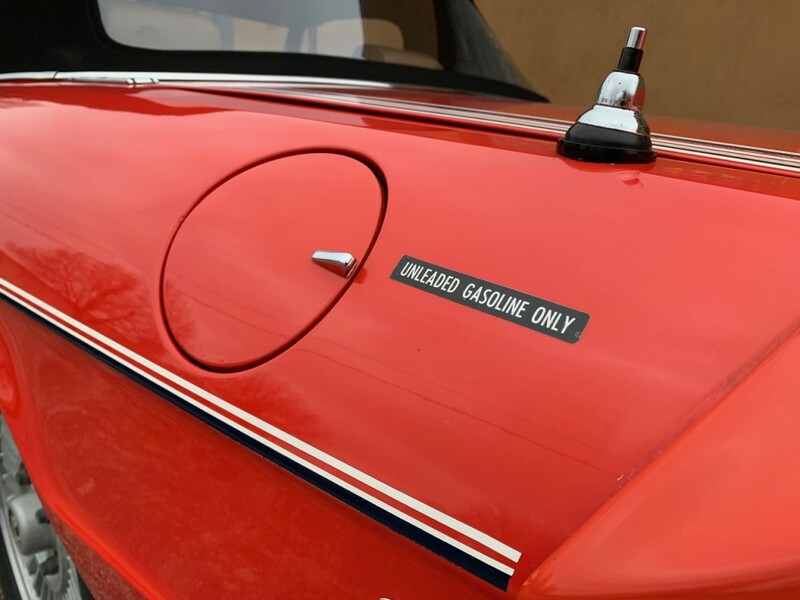 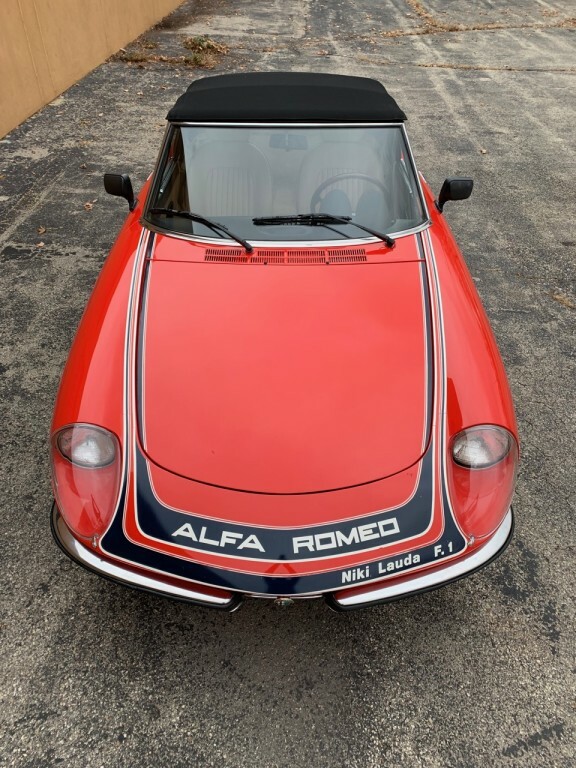 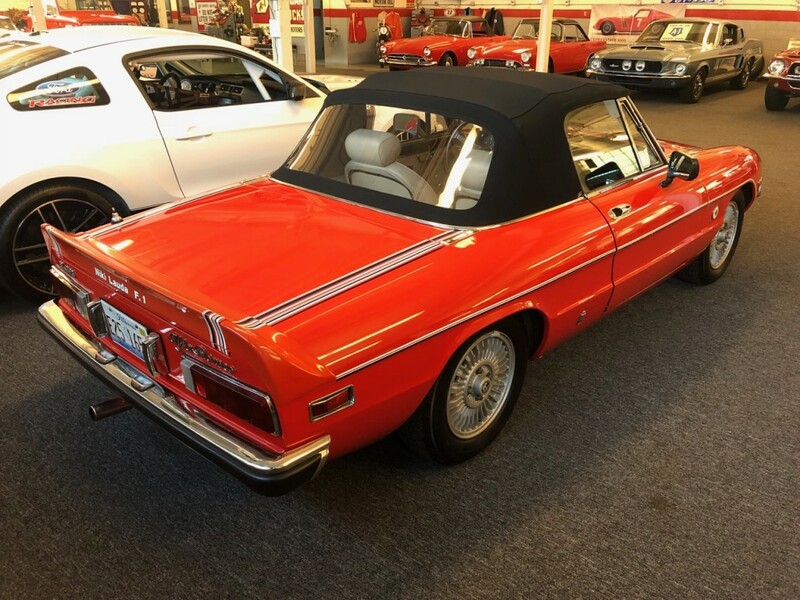 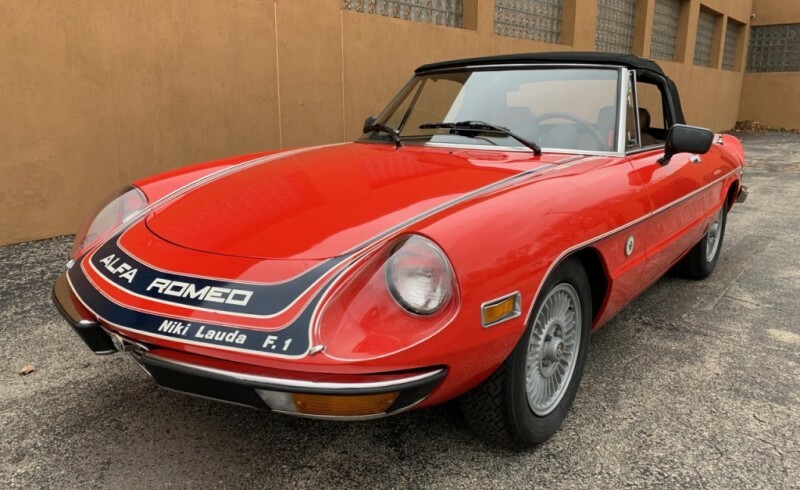 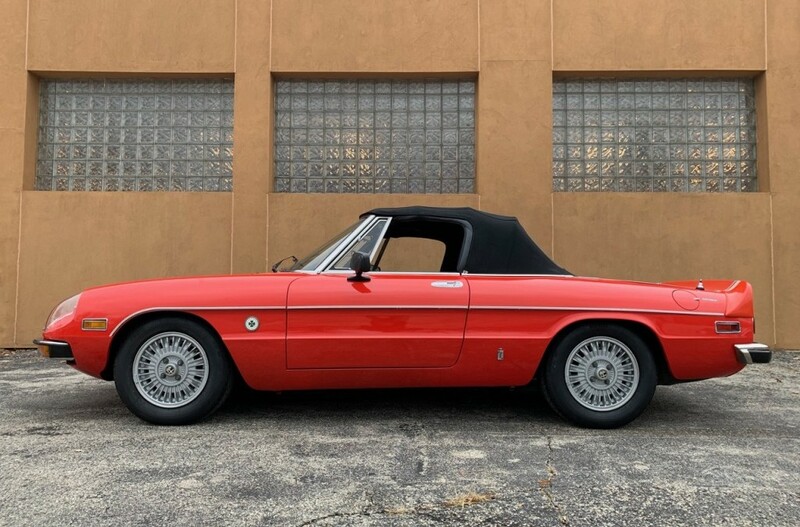 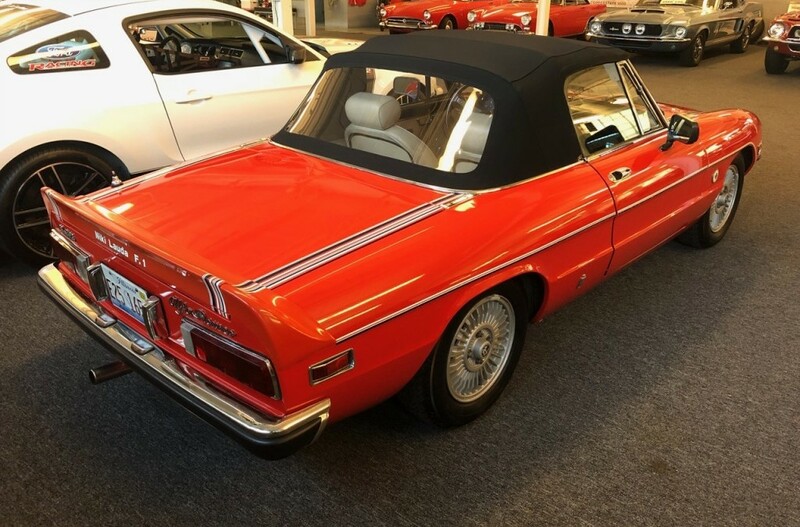 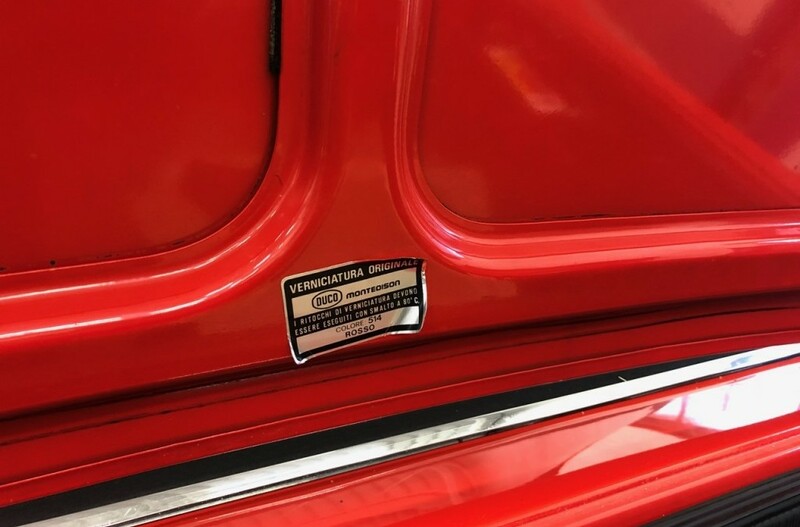 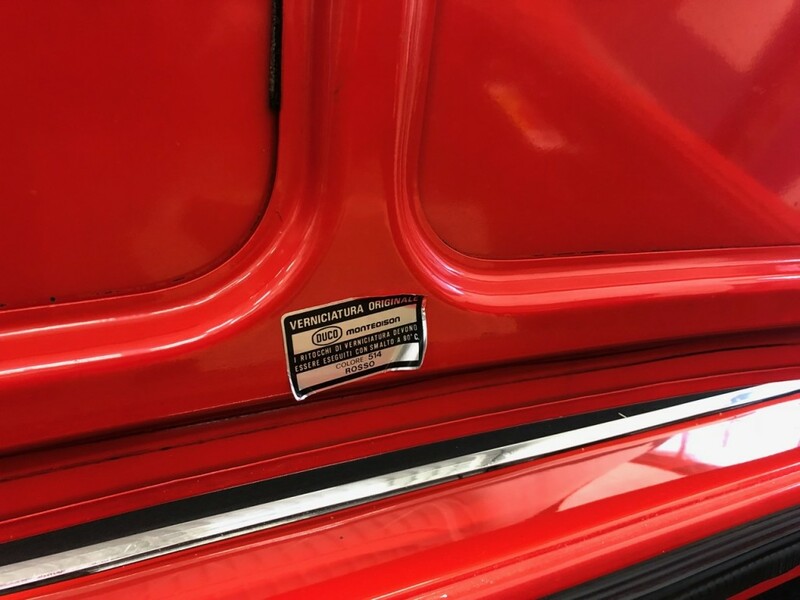 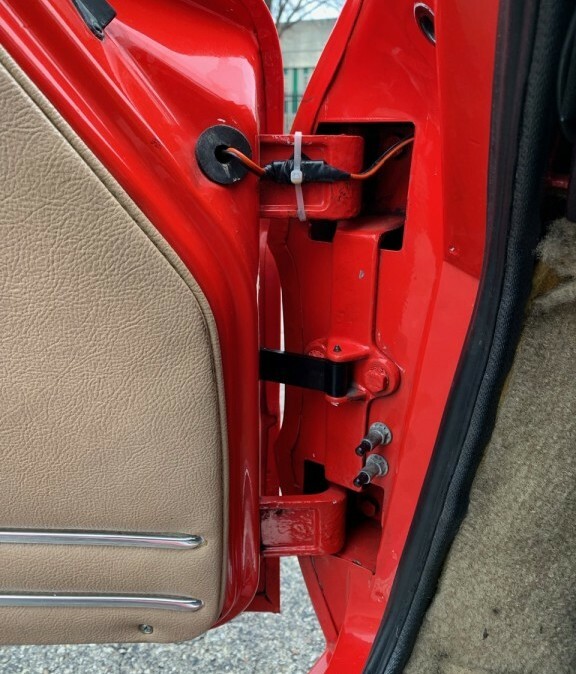 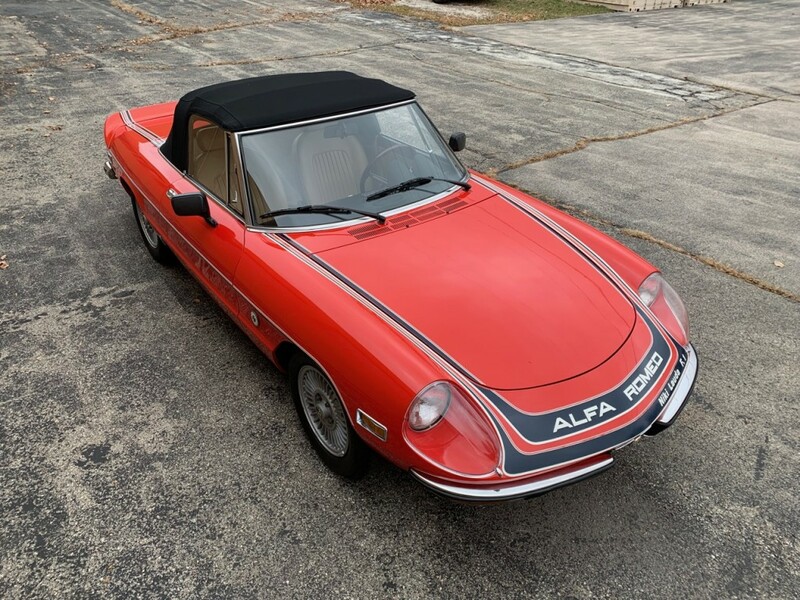 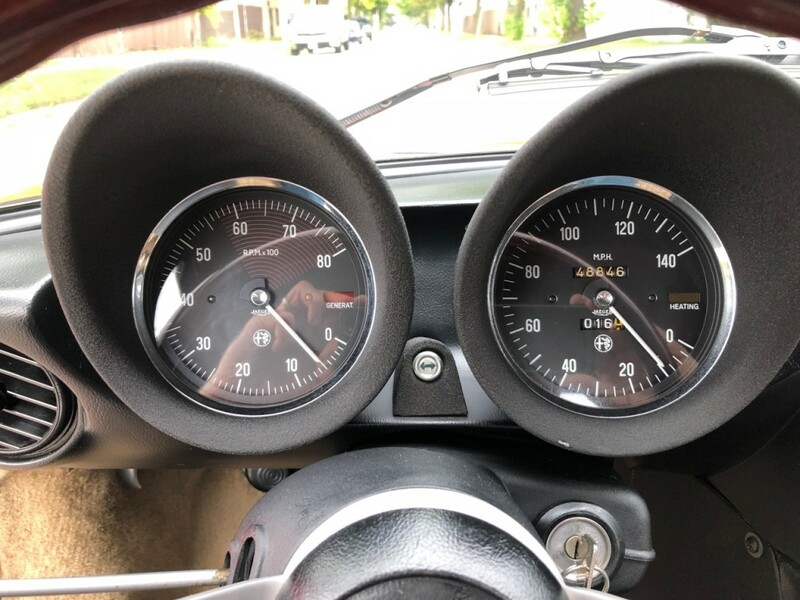 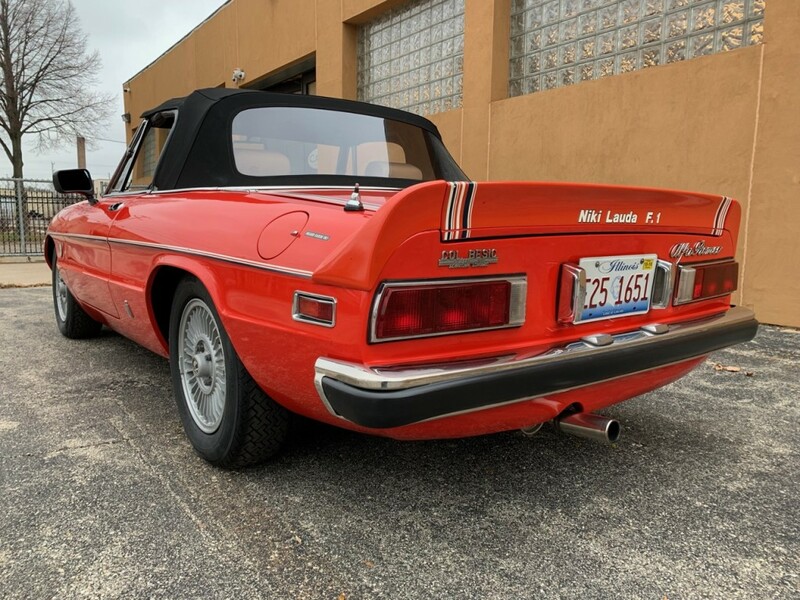 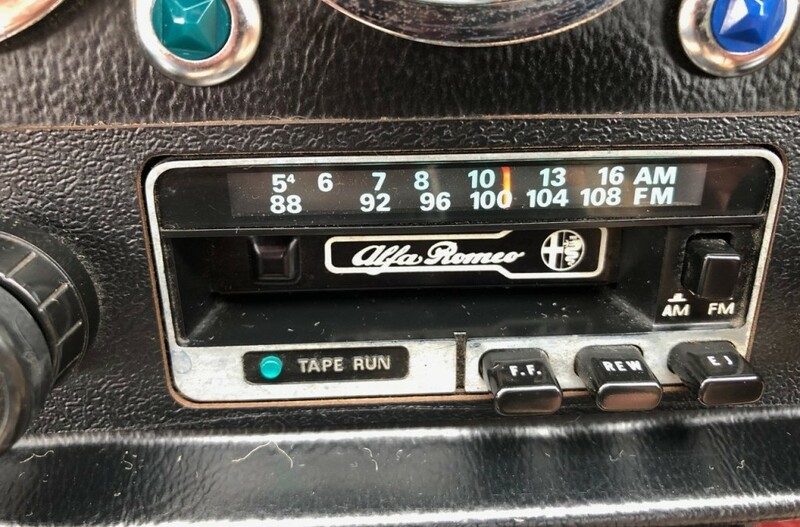 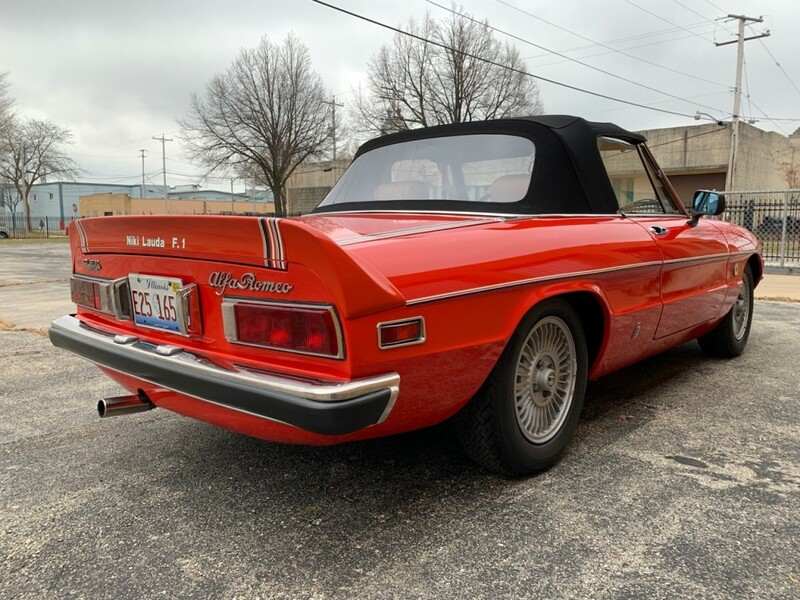 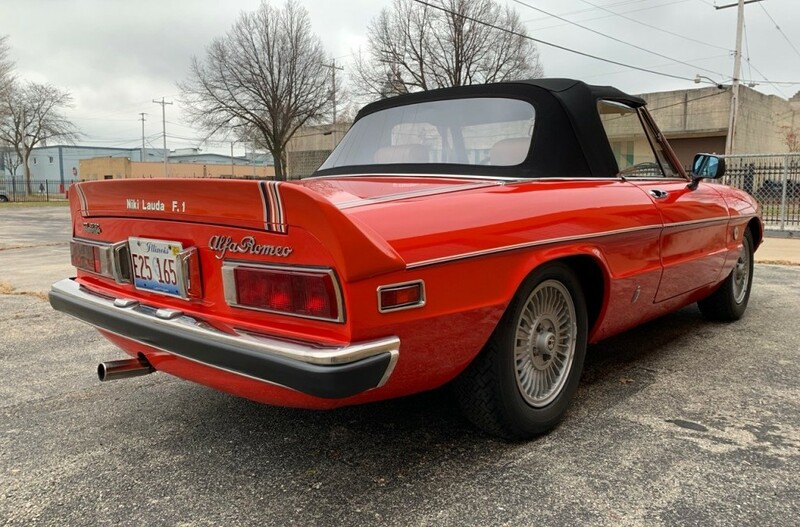 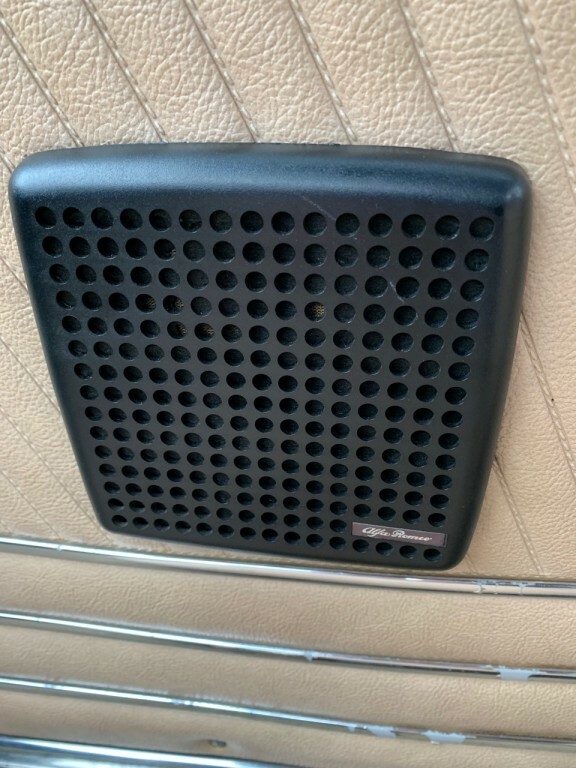 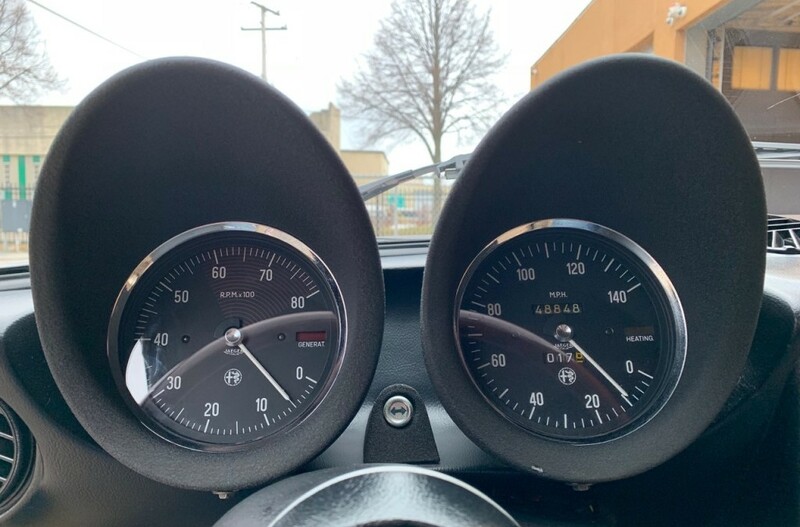 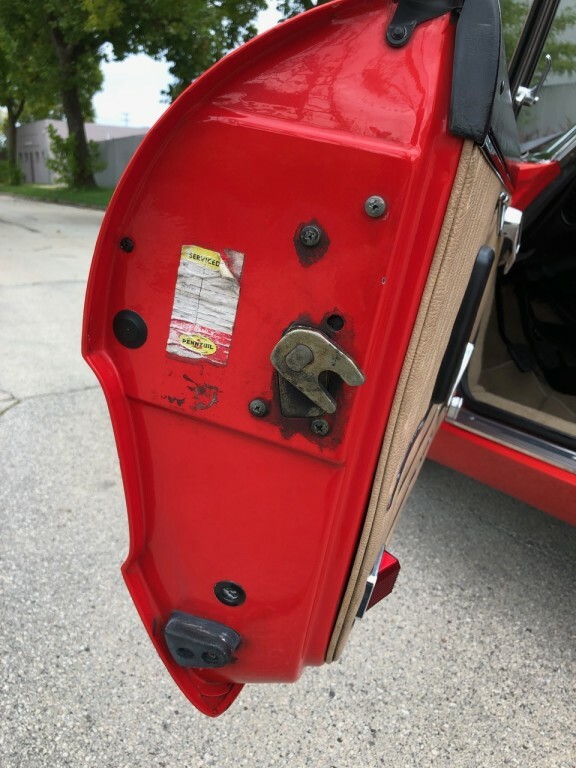 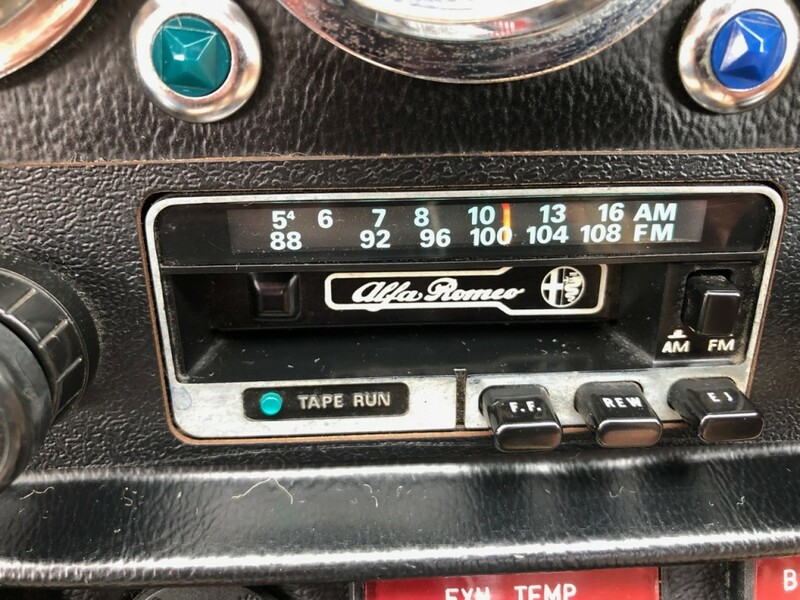 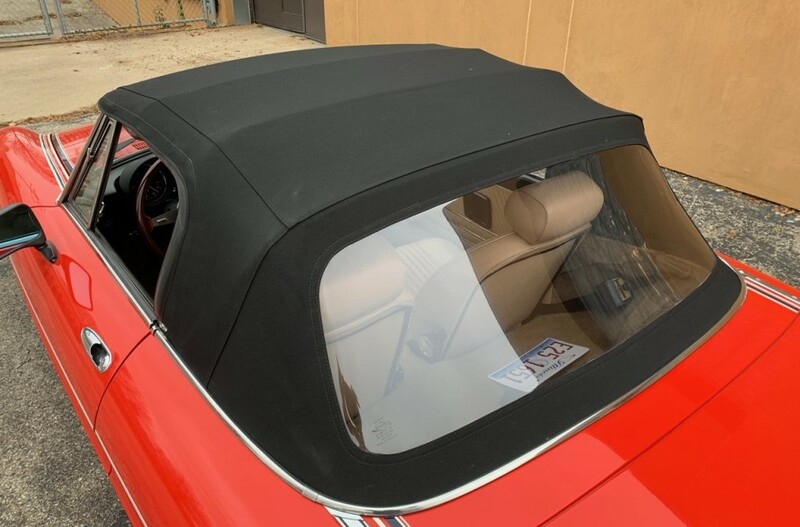 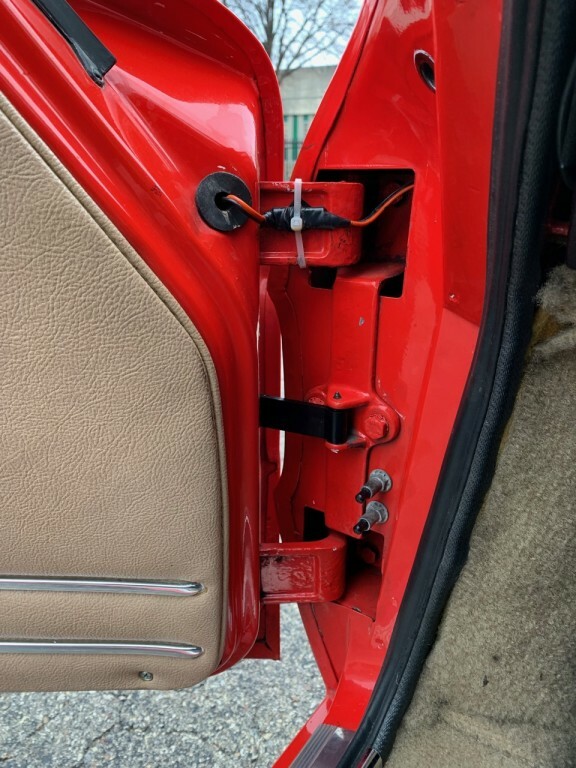 Its original paint is highly impressive, as is its rarely seen saddle color interior right down to its original Alfa Romeo radio and door speakers. 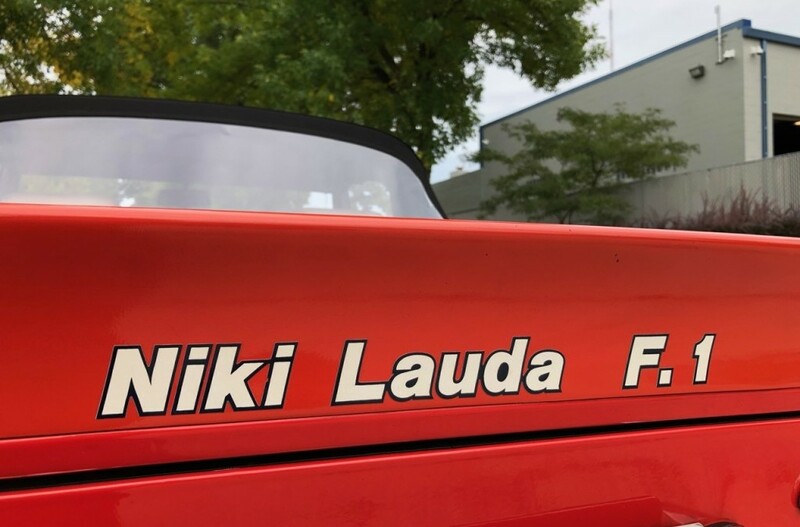 Again, while a Niki Lauda Spider may pop up from time to time I haven’t seen one this good since the 1980s. 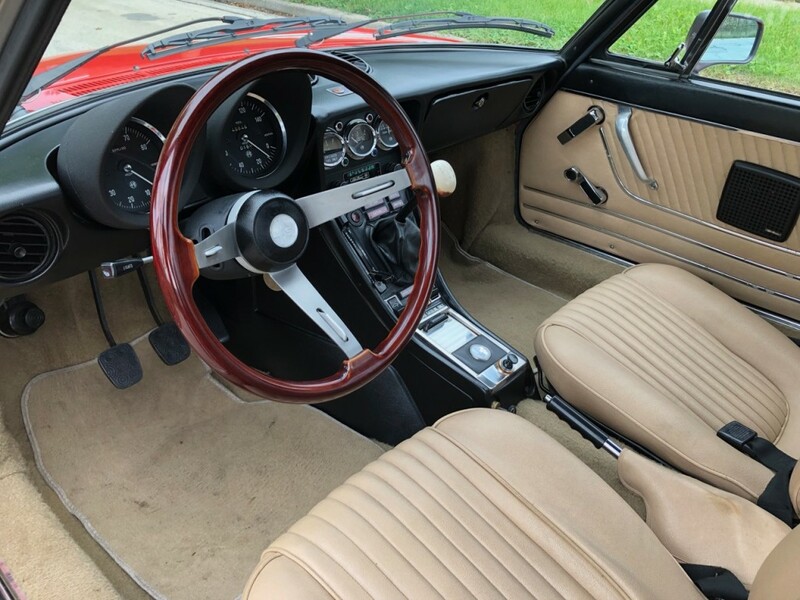 And, with its subtle tweaks, improved looks, and pampered existence since new this is a car for somebody who understands the difference between great and “ok.” It has absolutely zero rust, and amazingly clean chassis, strong and quiet 2L engine, crisp gearbox, and confidence inspiring power four-wheel disc brakes. 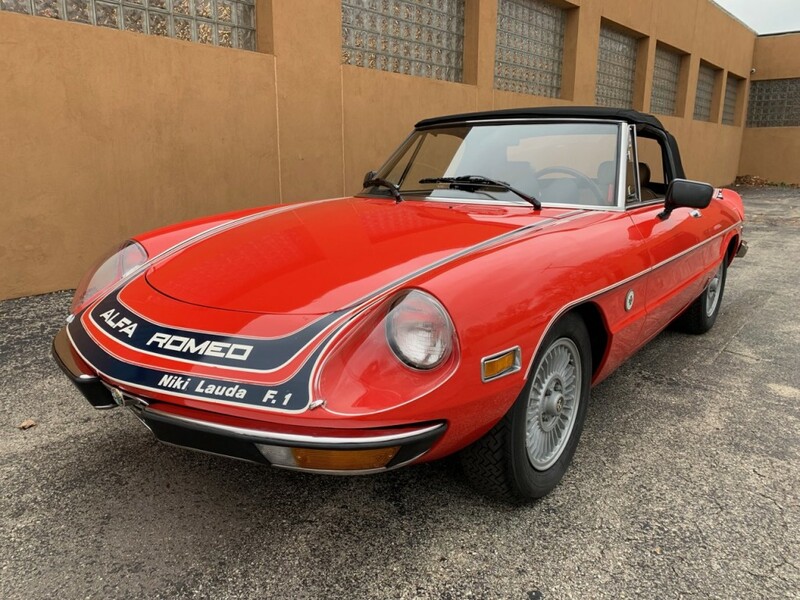 So, if you want a really special “Kamm-tail” S2 Spider this may be just the ride to turn you into a life-long Alfisti or Alfista as well!